What’s the story: On the eve of the 1992 LA riots, corrupted police officer Eldon Perry (Russell) watches his world of power and control begin to collapse. What’s the verdict: Ask most people to name Kurt Russell’s best performance and you’re likely to hear The Thing’s MacCready, Escape From New York’s Snake Plissken, Tombstone’s Wyatt Earp, The Hateful Eight’s John Ruth, or Elvis’, er, Elvis. There may even be some who cite The Computer Wore Tennis Shoes’ Dexter. However, they should be watched closely. A strong contender for Russell’s finest hour onscreen is as dangerous rogue cop Eldon Perry in 2002’s Dark Blue. Subjecting his handsome, boyish features (and suitably cobalt baby blues) to an emotional maelstrom, it is astonishing how the actor’s face and physique literally sags as the weight of his actions pulls him into a hell of his own creation. Fearless in how he humanises his bigoted, compromised lawman, Russell isn’t afraid to get stuck into moral mud with casually delivered racial epithets and shocking police brutality. Over five days leading up to the verdict in the Rodney King trial, he will realise that he and officers like him have contributed to the fire that engulfs South Central LA. Not to say that Dark Blue, which came and went on original release and has largely been ignored since, is merely a dynamite lead performance. Despite its 16 years since release, depicting a time 26 years ago, this sadly still resonates in a time of Black Lives Matter and caught on camera brutality. Based on a story by James Ellroy (set at the time of the 60s Watts riots in LA) and scripted by Training Day’s David Ayer, this is a blistering police thriller, brimming with preoccupations of both writers. Rule-and-head-breaking cops? Bang. Systemic police corruption? Bang. Shocking, off-hand violence? Reload and double bang. Taking the ride with Russell is a first-rate cast of then-fresh faces and seasoned actors. Underworld’s Scott Speedman is Bobby, Russell’s protégé, physically akin to his mentor and being dragged down the same path. Overseeing both men is Brendan Gleeson as fearsome Assistant Chief Jack van Meyer, himself not above stretching a few laws to ensure things go to plan. On the side of the angels is Ving Rhames’ Deputy Chief, the actor’s trademark baritone lending weight to his incorruptability, plus Michael Michele as an ally in his corner. Dash Mihok and rapper Kurupt are terrifying as a pair of amoral crackhead stick-up men tied closer to Russell’s Perry than either party realises. Jonathan Banks (forever Breaking Bad’s Mike) is another good face on display as a Chief willing to look the other way. Interestingly, Russell’s lawman is not on the take, more totally corrupted. Evidence comes distant second to securing a conviction. Anyone saying otherwise will have weaknesses exposed. Tightly scripted and superbly directed by Ron Shelton on location around South Central LA, Dark Blue deserves re-appraising as one of the great crime thrillers. 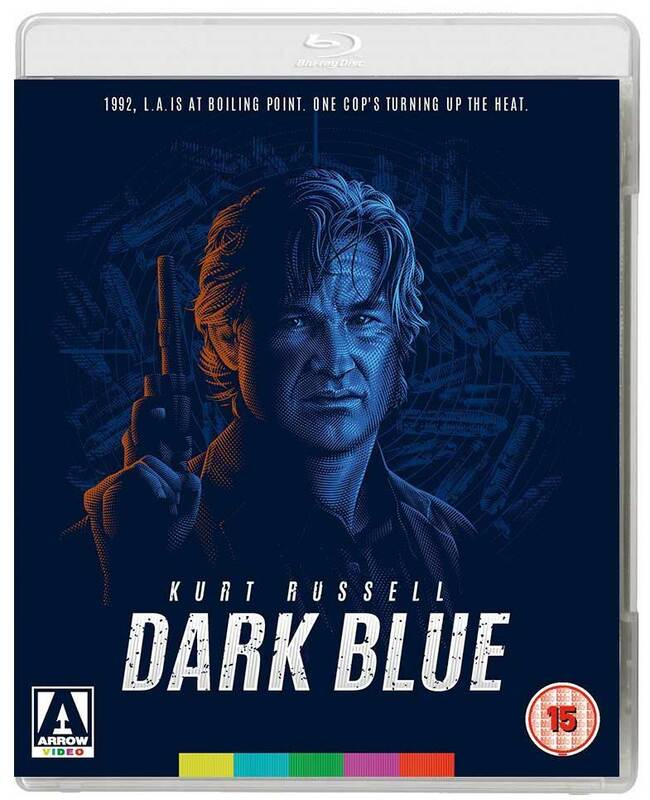 Archive extras from previous Dark Blue releases have been ported over to accompany Arrow’s handsome Blu-ray release. Chief amongst these is Ron Shelton’s audio commentary. Fact-filled and with zero dead air, Shelton provides a mini-masterclass on how to construct an authentic looking cop movie that dives deep into thriller conventions. A quick turnaround film (44 days shooting following 40 days prep), Shelton gives praise to the former officers who assisted in creating a real, breathing world. The director discusses how the script was reworked in editing to put the audience more in the know than Kurt Russell’s Perry, so the tragedy of the character comes to the surface sooner. A director of sports movies such as Bull Durham (which was intended to star Russell until Kevin Costner showed interest), Shelton also reveals how his handling of male dynamics and female frustration was perfectly suited to a film about law enforcement. He describes how the ticking timebomb of the Rodney King trial informs character actions and points out moments where budget and time restrictions impacted the film. We think he’s being harsh on himself, but it’s interesting to hear a director identifying what he would have done differently. Shelton returns repeatedly to the power of Kurt Russell’s performance, charting his descent from swaggering bravado into a dark, dark place. It’ll have you seeing things you’d not already acknowledged in the actor’s superlative turn. Publicity interviews with the cast and Shelton are a rarity in also being more thoughtful than most junket chats. Particularly Russell, who discusses at length the tension society has between keeping law enforcers in check while also demanding protection. It’s not the typical “everyone was great to work with” filler, but an actor clearly impassioned about the project. Lengthy, revealing feature comments from the production and costume designers, plus the consultants who contributed their expertise. It also covers James Ellroy’s original 100+ page treatment, entitled The Plague Season, and set during the 1960s. Ambitious sounding and totally intriguing, it sounds like material primed for an HBO miniseries. Trailer and TV spots are effective in selling Dark Blue as a taut thriller, pitching it as a battle of wills between Russell and Rhames’ characters.